rec. 2015, Elgar Concert Hall, University of Birmingham (Young and Gordon); 2016, Middletone Hall, University of Hull (Pritchard and Borenstein). Simon Desbruslais has followed up his excellent ‘Psalm’ album of new concertante works for trumpet (review) with this equally vivacious Signum offering, named after the Toby Young work with which it opens. His solo partner-in-crime on three of the four works is British pianist Clare Hammond, who has produced three well-received contemporary piano recital albums for BIS to date. Why trumpet and piano? Ostensibly the impulse is Shostakovich and his first piano concerto with its trumpet obligato. Desbruslais tells us this repertoire staple was originally intended as a trumpet concerto before his instrument was seemingly relegated to occasional commentary. As has been well-documented Desbruslais has admitted to a zeal for persuading contemporary composers to extend this area of the repertoire –which is surely no bad thing. The passage of time is an odd phenomenon. Back in the late seventies, rock and roll had only really been around for a couple of decades and when composers such as Tippett or Michael Berkeley attempted to infuse popular elements into their works they were often derided by sniffy critics – a stance which undoubtedly reinforced accusations of elitism within classical music. Fast forward forty years and the first generation of composers who grew up when ‘pop’ was the norm have emerged, the boundaries between genres are thankfully disintegrating, the preoccupation is now with the production of ‘good’ music, rather than ‘pop’, ‘classical’, ‘jazz’ or whatever. Nobody bats an eyelid when Thomas Ades incorporates elements of house music into ‘Asyla’ (itself now 20 years old!) or ‘arranges’ a Madness hit, or when the London Sinfonietta interpret Aphex Twin. Nor is this a one-way street: only last week I visited my tiny local music venue to see a four piece ‘rock’ band, all RNCM graduates, seamlessly appropriating the live electronic techniques pioneered by Boulez at IRCAM and used in ‘….explosante-fixe……’ (the music of this band, Plume, was simultaneously alluring and thrilling by the way - YouTube them!). 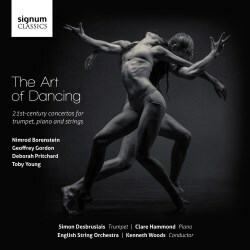 I mention this as one of the two really compelling pieces on this disc is indebted to contemporary popular dance forms. This is Toby Young’s opening suite ‘The Art of Dancing’ which features movements entitled ‘Garage’, ‘Acid House’, ‘Drum and Bass’ et al. In fact the listener would have few suspicions of this on first encountering the beautiful prelude which opens the work and seems to have emerged directly from the great English string tradition. Here a melancholy chrysalis of melody tentatively metamorphoses into a lush, songful butterfly – one would certainly be hard-pressed to realise that in its original form this was a pop tune written for a Japanese boy band! The following movements are variations built on this prelude – thus the composer points out it adopts the characteristics of a baroque ‘dance suite’ rather than those of a typical ‘concerto’. The high register of the jagged solo piano chords at the outset of the second ‘garage’ movement gives us the initial clue that ‘club’ music will play a part – also that the piano/trumpet relationship is an equal one. The irregular piano line is punctured by quiet interjections from Desbruslais’ piquant piccolo trumpet in a heavily syncopated but restrained movement which leads to ‘Acid House’. Here the rhythmic fingerprints are more overt in a movement whose central section is infused with dreamy string psychedelia before the soloists re-enter to gently end the ‘trip’. A strong rhythmic base underpins the following ’Drum and Bass’ section, whereby a low piano reiterates an ostinato pattern which interlocks delightfully with Desbruslais’ tactful, jazzy trumpet. After its decisive and abrupt conclusion, the mournful, extended ‘Trance’ affords the listener time to chill out. The trumpet is beautifully integrated into the texture as this proceeds in its stately way. ‘Trance’ has the effect of a nocturne in the half-light. Young likens the ‘Breakbeat’ section to a jovial ‘Totentanz’, in which we find our dancing feet once more. The trumpet produces its brightest sounds just as this concludes, whereby the postlude takes us back to the melancholy of the start. Young’s piece is consistently entertaining, often oddly moving and the short episodes are pleasingly absorbed into the larger structure. The solo playing from both Desbruslais and Hammond combines confidence and assertiveness with tact and grace. 2016 saw the 100th anniversary of the Battle of the Somme; it triggered an outpouring of creativity and homage from writers, painters and composers alike. Deborah Pritchard’s truly haunting Seven Halts on the Somme is her musical response to a series of viscerally powerful paintings by the Manchester-born artist Hughie O’Donoghue. His own rationale for these works is revealing: “The series title ‘Seven Halts on the Somme’ refers to seven places where the army was stopped, people were stopped and I have stopped and paused for thought. The trees at Trônes Wood have now regrown and though their foliage is dense, sunlight can still penetrate the tree canopy and illuminate the ground. Something happened here that demands of us that we remember”. It is not the first time Ms Pritchard has been inspired by visual art – her magnificent violin concerto Wall of Water (re- released earlier in the year on Nimbus and reviewed here ) was inspired by the work of Maggi Hambling. That piece got right under my skin and so does this. Of course the very sound of the trumpet evokes the martial: Seven Halts…takes full advantage of this link to delve far deeper into our collective unconscious. One commemoration of the Somme in 2016 involved the premiere of Iain Bell’s In Parenthesis at Welsh National Opera, a work based on David Jones’ staggering epic poem of life in the Somme trenches. Both of these works present a vivid account of how soldiers spent their time at these ‘stopping places’ – O’Donoghue’s stark and bold colours (his paintings are freely accessible on the web) attempt to reconnect these mnemonic shards. The seven brief movements of Pritchard’s work (which is structurally at least a sibling of Skyscape, her contribution to Desbruslais’ previous album) create in turn atmospheres that evince the restlessness of waiting; the anticipation of terror and violence; the space for elegiac reflection. In Seven Halts…..the solo piano is replaced by the autumnal hues of Rita Schindler’s harp. The brief movements head with true inevitability towards the concluding panel Guillemont to Ginchy – the matching image depicts the road between these two places stretching towards an unknown but more hopeful future – Pritchard’s music subtly but masterfully does the same. The whole piece is compressed and intense - its individual panels elude superficial description. Desbruslais draws a rich collage of tints from his instrument which do seem to reflect the art that inspired the music. Geoffrey Gordon’s short work Saint Blue is also inspired by visual art, in this case two works by Kandinsky, All Saints I (1911) and In Blue (1925). This ten minute piece adopts an ABA design and begins with scurrying strings, sudden piano interpolations and eventually extended solo trumpet whose busy part is brilliantly carried off by Desbruslais. Gordon exploits the full colour potential of his ensemble. In this work the spirit of jazz is not too far removed from Gordon’s sound world, most obviously in a central section where muted trumpet and solo bass are interrupted by Hammond’s restless piano commentary. While this piece is an enjoyable romp, I struggled to extract a real sense of this composer’s individuality. And I could say the same about the concluding work, Nimrod Borenstein’s Concerto for piano , trumpet and strings. I was greatly looking forward to hearing this, especially after the superb recent Chandos album devoted to this composer, but personally I found the ghost of Shostakovich just too obvious a presence throughout its three movements. Many of its gestures and shapes evoke the Russian master – most notably in the outer movements. Borenstein has a real flair for orchestral colour as was demonstratred throughout the Chandos disc: while the present work involves some colourful pizzicato passages the smaller ensemble seems to elicit a less distinctive style and ultimately, despite flawless contributions from the soloists, I found the musical material across the three movements a little underwhelming, though other listeners may respond more readily. Signum’s recording is ideal, with both soloists beautifully integrated into the sound picture. Desbruslais’ and Hammond’s advocacy of this unfamiliar repertoire can only be admired and once again the contribution of the superbly drilled English String Orchestra under Kenneth Woods is exemplary. While trumpet enthusiasts need not hesitate, the rewards for those beyond that circle are also ample.